Thanksgiving baking is in full swing here. I always bring pies, rolls and cranberry relish to the family dinner and this year, I’m on top of it! The pie crusts and fillings are all prepped, stored in the fridge and waiting to be assembled for baking on Thursday. The roll dough is in the freezer, the relish is “melding”. It seems like all those years of failed allergy baking experiments have finally borne fruit, and I can confidently face Thanksgiving dinner. But I’m not one to rest on my laurels. I have a terrible weakness and curiosity that pushes me to try something new. 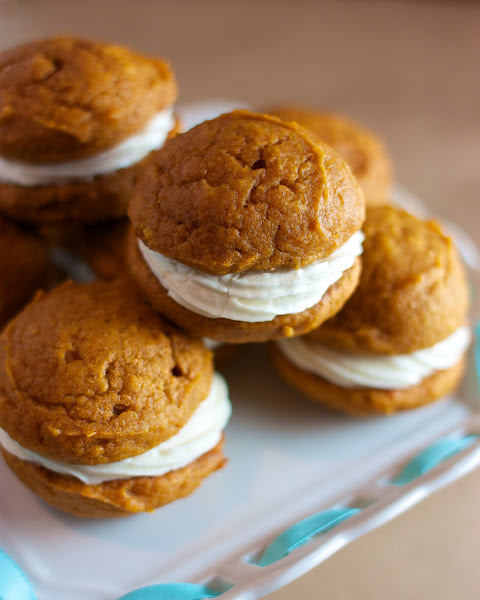 I had an extra couple cans of pumpkin that were just begging for a home, and these mini treats are just perfect. They also freeze wonderfully, so eat half and put the other half in the freezer for a little lunchbox dessert. You can make a half batch of this very easily. Just use the smaller 15 oz sized can of pumpkin (1 3/4 cups), eyeball a half tub of cream cheese and cut all the ingredients in half. You’re smart, you can do it. Whisk the white flour, whole wheat flour, baking soda, baking powder, salt & spices in a large mixing bowl. Whisk the sugars, oil, pumpkin and vanilla together in a medium mixing bowl. Pour the wet ingredients into the dry ingredients and carefully blend together. Scoop 2 tablespoon sized blobs of dough onto a parchment lined baking sheet. I have a #40 size food scoop that is indispensable. It’s the perfect size for cookies. Bake for 15-18 minutes or until the tops are fully set and edges are slightly browning. This is a case you don’t want to underbake, and should err on the side of overbaking…otherwise the cookies get really sticky and doughy. You’ll have extra frosting to spread on graham crackers later. Cream the Tofutti cream cheese and margarine together until fluffy. Add the maple syrup and beat again. Add the vanilla at the end. If the filling seems too thick, add a few splashes of soy/rice/coconut milk. Sounds delicious! I’m so glad I found your blog through Kids with Food Allergies. Good work! What can I substitute to make a wheat free version for my son? Lori, you could try substituting any of the wheat-free flour mixes out there. I haven’t had the greatest luck making dairy and egg-free baked goods that are also wheat-free. Wheat has gluten, which helps bind baked goods together. Egg is also a binder. Baked goods usually work out if you have at least one binder, but missing both egg and gluten…things tend to crumble apart. That being said, if you’re going to try it…trying a baked good with either pumpkin or banana will be most likely to succeed because the pumpkin or banana will help bind a bit. For all the dairy allergy sufferers out there: Tofutti is known for having many cross-contamination issues with dairy. Galaxy Nutritional also makes a dairy-free cream cheese substitute. Just ran across this blog. Love it. My daughter has a nut allergy and one of her good friends has an egg allergy. I’m always looking for resources for good food for them! Thank you Heather! Happy baking! Is the one teaspoon “powder” baking powder? Yes, thank you! I just fixed that! I made this today and using gluten free bisquick in place of the dry ingredents and it came out perfectly. This recipe is so delicious and I will be making it again. Awesome Christy! Thanks for the success story! Making these right now to take to grandma’s for Thanksgiving. Mmmmm. So glad I found your recipes. We’re egg- and dairy-free by choice. But nut free, well, ’cause we have to be. Thanks! 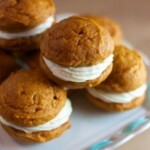 These whoopie pies are now a staple on our Thanksgiving dessert table. Just about to make them. The kids can’t wait to eat them! Hi Terry, I tend to bake with canola oil or soybean oil. Olive, coconut and corn oils are all very strong in flavor for baking.